One of the 19 DGZfP Regional Groups is headquartered in Hamburg. In 1996, 16 lectures were held there, attended by a total of 278 visitors. These figures  show that compared to other regional groups, Hamburg has a high level of interest in NDT. Mr. Henrichs (HEW Hamburg's Power Company), the chairman of this group, opened the 238th meeting on 9 April 1997 and introduced two lectures by Mr. Anton Erhard (BAM Berlin) and Eckhardt Schneider (FhG IzfP Saarbrücken). Near backwall surface crack detection. By Anton Erhard BAM Berlin, reviewed by Rolf Diederichs. Mr. Erhard introduced the use of modeling methods for a 'simple' 45° angle testing of near surface backwall cracks. That classic method which uses the mirror effect is taught in basic courses of UT level 1. Everybody knows that the 45° principle works and a test with 60° should not be used. 45° gives clear indications for small cracks on the surface. Why use modeling for that? Looking at the problem more closely means varying the angles of crack orientation. What we will then see is an increase in complex sound field interactions at the crack and in conjunction with the backwall (mirror effect). It comes to mode conversion which can be quite difficult to interpret at the A-scan display. Such modeling methods can help us to understand that and the goal is to make the modeling for practical needs applicable. Mr. Erhard mentioned three German sites that offer modeling programs. Kassel Langenberg EFIT Method, that describes propagation very exactly but needs more computer power. The VGB (Verband der Großkraftwerksbetreiber) recognized the potential of such modeling methods and has requested a bid for its practical use for flaw detection evaluation. Another theme was the Stud inspection which also uses the mirror effect. That was presented at the DGZfP annual conference in Lindau '96 (Abstract). The major challenge of this task was the improvement of the bad signal to noise ratio due to the spiral ridges. A solution was the generation of a destructive interference of the spiral ridges signals. As another application an echotomogram of a nozzle inner radius inspection by use of array technique was shown . Meanwhile the pulser receiver (0.5 - 8 MHz) hardware is a small device today - about 20x30x70mm (WxDxH). Another larger cabinet has a bandwidth of 2 -24 MHz for use in aircraft testing as shown at the ASNT conference in Seattle . For control and evaluation a PC is used (laptop is OK here, too). A new 3 MHz array 64 elements on one wedge was also introduced. A shift of 8 elements is performed by electronic means, working on one axis of the test movement and replacing the mechanical movement. The angles of 60°, 45°, and 70° can be changed during the test procedure. But more about this at the DGZfP conference in Dresden. A electronically swiveling scanner for material testing has not yet been realized. Mr. Erhard mentioned that in medical use, this is done by use of a matrix array. 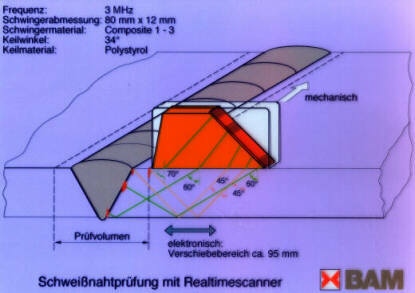 The medical application is easier than material testing since in the human body only one wave is propagated (long.) and we in the material testing industry must evaluate 2 or 3 modes (long., shear, surface). Nondestructive Characterization of State and Properties of Aluminum Structures. We thank Mr. Eckhardt for the contribution of a complete article for this report in the UT online June issue. Hierarchie analytischer, numerischer und approximativer Modelle Kurzbericht zu einem Treffen am 29.10.1996 des Unterausschusses (Leiter: Prof. Langenberg) "Theoretische Modelle zur Praxis der Ultraschallprüfung" des Fachausschusses für Ultraschall der DGZfP.